The barn quilt phenomenon was born in the early 2000’s out of one American woman’s desire to pay tribute to two aspects of both her family’s as well as her country’s heritage; quilts and barns. Since then the idea of painting quilt patterrns on barns has mushroomed as families, historians, artists and businesses have created barn quilt trails across North America. Early pioneer quilts were initially simple utilitarian blankets made from bits and pieces but if time allowed some quilters created patterns which if they became popular acquired a name or multiple names depending on where one lived. These named blocks have played an important part as each barn quilt has been carefully chosen to tell a story. 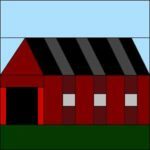 How appropriate to have a quilt block depicting a barn to help bring attention to the fast disappearing wooden barns in our area. Both quilts and barns are examples of pioneer ingenuity, craftsmanship and community spirit. Early settlers had few possessions but at quilting bees and barn raisings they combined their talents and tools to help one another out. At a time when people often lived great distances from one another and could rarely leave the homestead because of household and farm chores, these were much anticipated social times. Building a barn was crucial to store crops and livestock since until the mid 1800’s panthers, lynx, wild cats, bears and wolves existed in the area. However because the settler was intent on clearing as much land as possible for fields a crude long home and other structures had to suffice for the time being. When time came for something more substantial a barn raising was organized. The wood was generally harvested in the winter and cut and numbered by an experienced builder who would also coordinate the manpower at the barn raising. Attendance at the raising was mandatory if one was to maintain his standing in the community. Approximately 100 men and their families who would prepare the food were needed to build a large barn. Besides the hard work there was much socializing and fun. Teams were often formed and a friendly rivalry occurred as each rushed to be the first to complete its task. It was also common for the foundation and floor to be completed on the first day and then tested that night with a good old barn dance. On the second day the barn was actually raised. One of Kent County’s most famous barns was the Sherman barn. Around 1805 Lemuel Sherman build a log cabin on the banks of the Thames at present day Thamesville. In 1811 he constructed a huge barn covered with two foot wide pine boards. After the Battle of the Thames in 1813 this barn was used as a hospital by both British and American soldiers many of whom carved their names and initials in its wood. Some spent months here recouperating and one Kentuckian stayed with Shermans and is buried in the family plot. This structure stood near the river where the Sherman cemetery is now located but at one point it was moved across the road. Today the 6th generation of Shermans still farm the same land as their ancestors but unfortunately the landmark barn burned down in 1929. Today, although few date from this early era, Chatham-Kent’s wooden barns are aging and disappearing. We should appreciate them while we still have them for their rustic beauty, craftsmanship and the people who built them.